Start with a new document, mine is 540×350 at 72ppi. If your document is a different size or DPI some of the filters may need to be adjusted accordingly to get the desired result. Standard business card size is 2.25" x 3.75", so I’m going to constrain my Rectangular Marquee tool to 3.75px and 2.25px, then I’ll drag out a nice sized selection and fill it with my foreground color which is #AAA494. Take this time to set the background color to #685b48 as well. 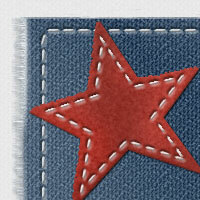 Add some tonal variation to the card while the selection is still made by selecting Filter>Render>Clouds. 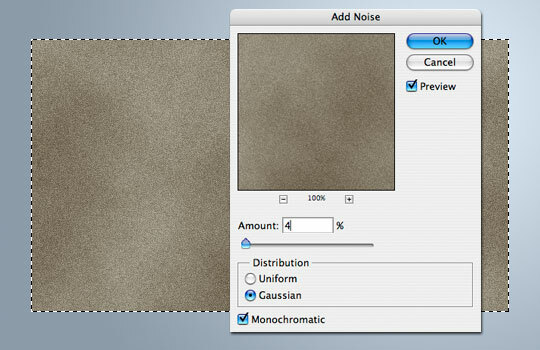 Now lets add some texture with noise by choosing Filter>Noise>Add Noise with the settings of 4/Gaussian/Monochromatic as shown below. 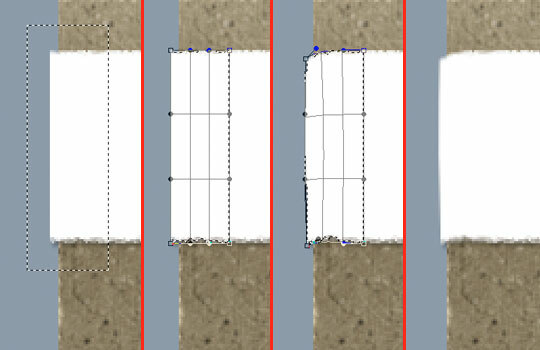 Due to the the production process of cardboard, typically fibers are aligned horizontally or vertically, which is why we added the noise in the first place, so lets go ahead and add this effect by first releasing the selection by pressing Command-D (PC: Ctrl-D), then lock the transparent pixels by checking the Lock Transparent Pixels icon at the top of the Layers palette. 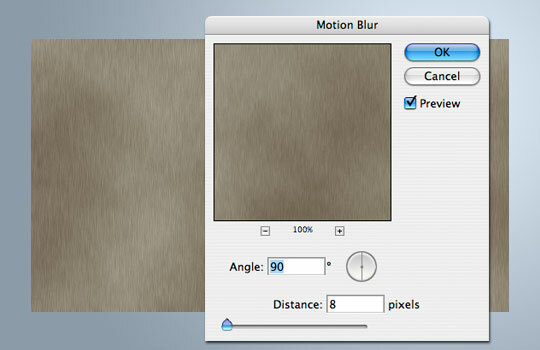 Now choose Filter>Blur>Motion blur with the Angle set at 90 and the Distance at 8. Now that we’ve got a bit of texture and variance in the card, lets add a few layer styles to add another level of effects. 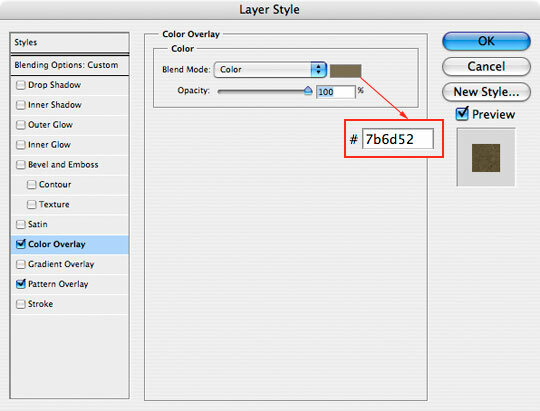 Apply the following layer styles to your card layer. 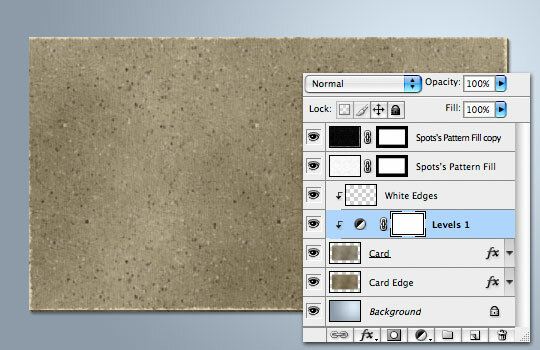 The final layer style is a Bevel and Emboss that will help us create the edge effects in the next step. 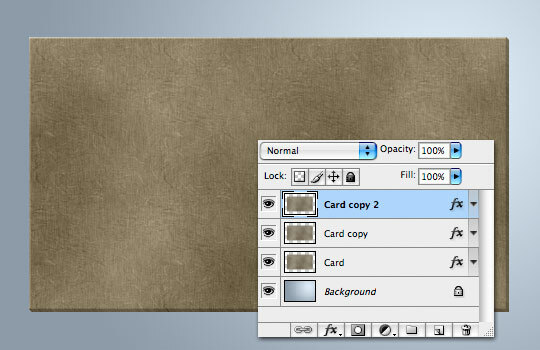 Next I want to create two duplicate layers of the Card layer by pressing Command-J (PC: Ctrl-J) twice. 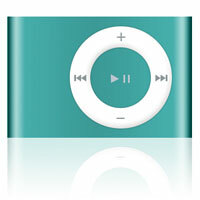 Move the top of these three layers 2 pixels up and 2 pixels left by using your arrow keys, then click on the middle layer and move it up 1 pixel and left 1 pixel. 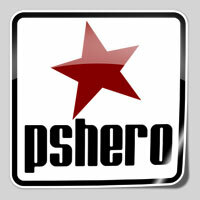 By offsetting the layers we can achieve a sudo 3D effect. 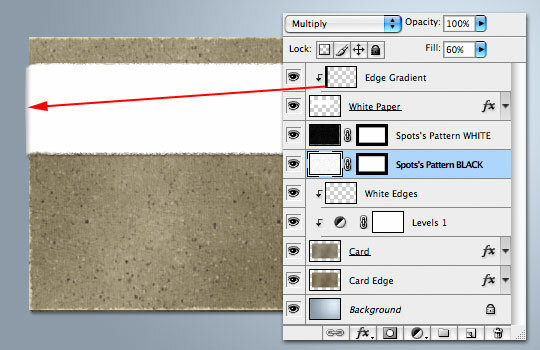 The lower two card layers ("Card" and "Card copy") need to be merged since they’re just edge details, so select them both and press Command-E (PC: Ctrl-E) to merge the selected layers. 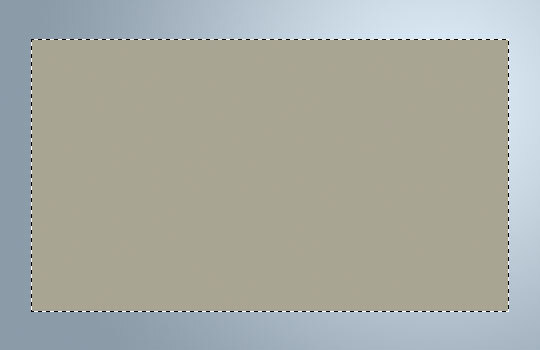 Rename this merged layer "Card Edge". 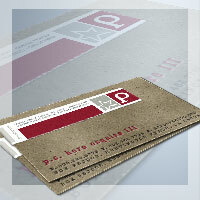 Open the layer styles for the top "Card copy 2" layer and remove the Bevel and Emboss style and lets go ahead and rename that layer "Card" again. 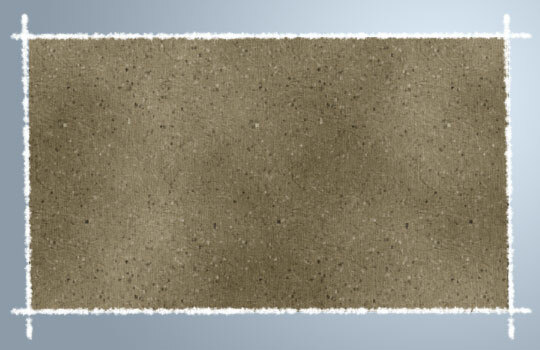 A good look at a piece of cardboard will tell you that the surface has small flecks of dark and lighter fibers, so lets add some of those now. 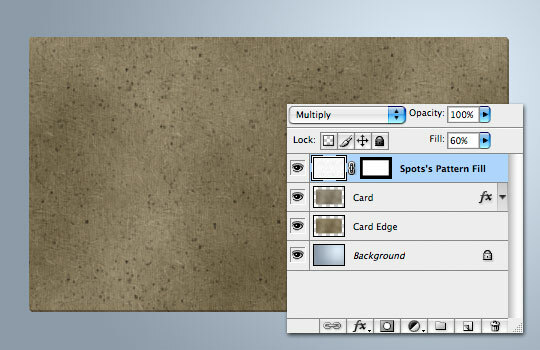 Command-Click (PC: Ctrl-Click) on the "Card" layer’s icon to create a selection, create a new layer above the "Card" layer called "Spots" and fill the layer with color. Any color is fine here since we’re going to turn the layer’s Fill opacity down to 0 right away. 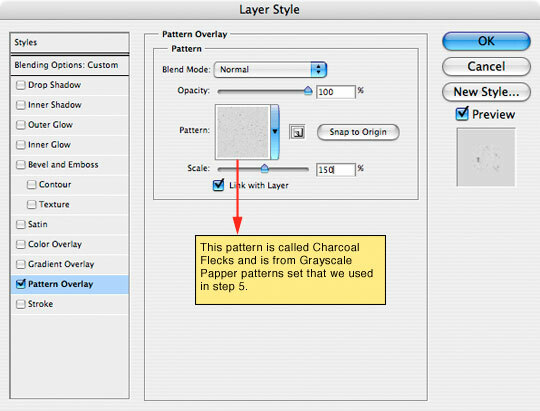 Add the following Pattern Overlay from the Layer Styles dialog. 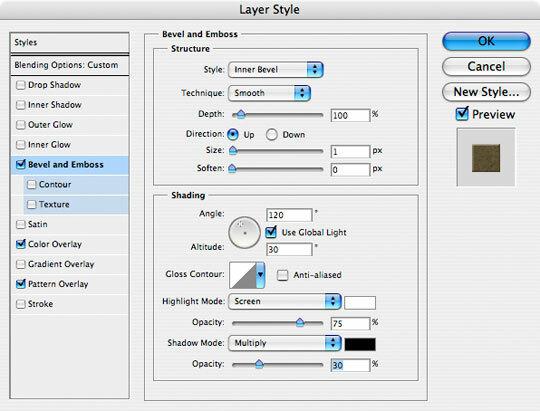 Now lets separate the layer style from the layer by Control-Clicking (PC: Right-Click) on the layer style icon and choosing Create Layers from the bottom of the menu. This will pull the layer style from the layer into a separate layer where we can work with it on it’s own. 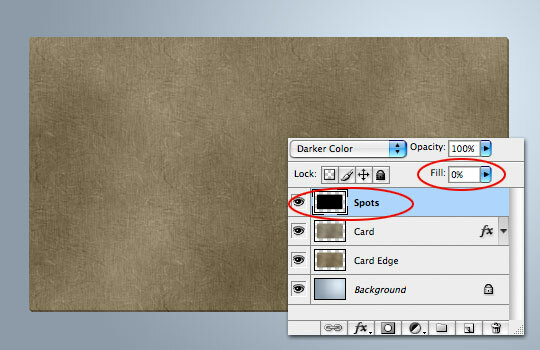 You may now delete the "Spots" layer, leaving the "Spots Pattern Fill" layer to work with. 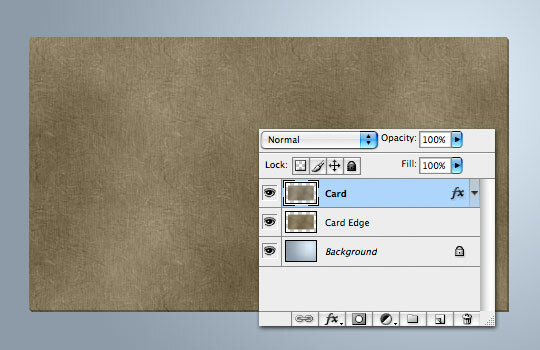 This will fill the screen with the pattern, so go ahead and add a Layer Mask to the layer by selecting the "Card" layer and then clicking the Add Layer Mask icon at the bottom of the Layers palette. The reason we applied the pattern as a layer style instead of just using the Edit>Fill>Pattern method is that by applying the pattern first as a layer style we are able to scale the pattern prior to applying it. Next we need to separate our spots from the background a little better, so press Command-L (PC: Ctrl-L) to bring up the Levels dialog. 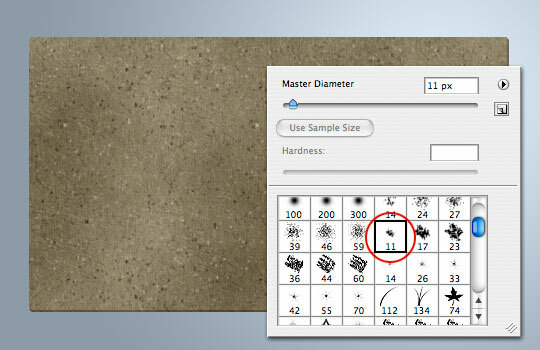 Drag the center slider to the right and the right slider left until the background is completely white and the spots really stand out. Now lets finish off the Spots by lowering the layer’s Fill opacity to around 60% and changing the layer’s Blend Mode to Multiply. Lets create some white spots now. 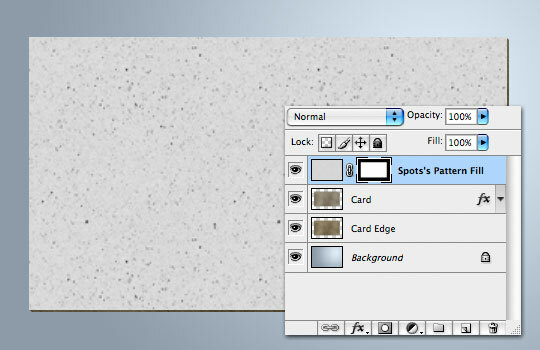 We’ll use the Spots layer we’ve already created. 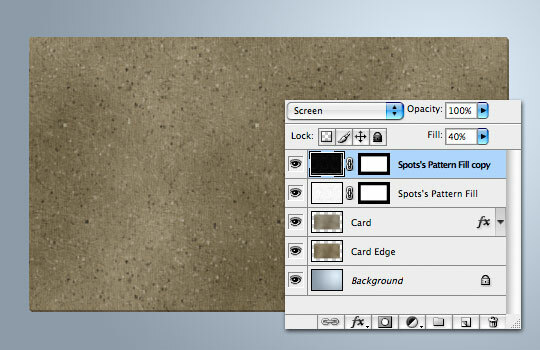 Press Command-J (PC: Ctrl-J) to duplicate the layer, then choose Edit>Transform>Rotate 180° to flip the spots around. Now invert the colors by choosing Image>Adjustments>Invert and change the layers Blend Mode to Screen and drop the Fill to around 40. 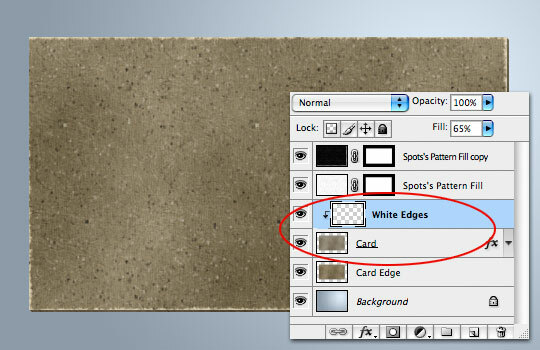 Lets add some worn edges to the card next by creating a layer above the "Card" layer called "White Edges". 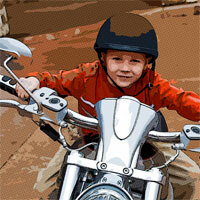 Set the foreground color to white and switch to the Brush tool by pressing the B key. 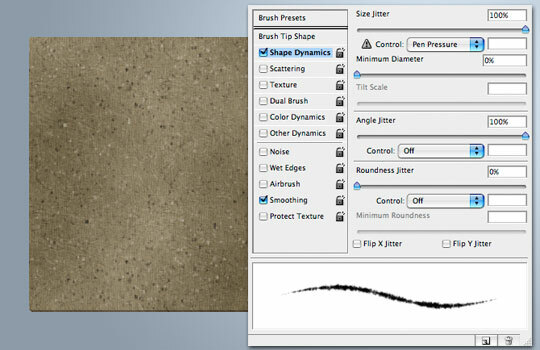 Choose the brush called "Chalk 11px" from the brush options. I did each side on a separate layer first to get positioning correct before merging the 4 sides together. Now simply create a Clipping Mask down to the Card layer (Control-click (PC: Right-Click) on the layer and choose Create Clipping Mask) and drop the White Edges layer Fill down to around 65% to get a nice roughed up edge effect. At this point we have a pretty good idea of what our card is going to look like. I decided the cardboard was a little dark for my tastes, so I applied a Levels Adjustment layer to the "Card" layer, and I added a drop shadow to the "Card Edge" layer. 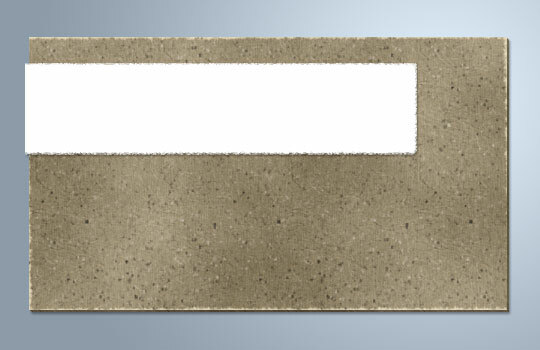 Lets move on to the white strip of paper we’re going to add to the top of the business card. 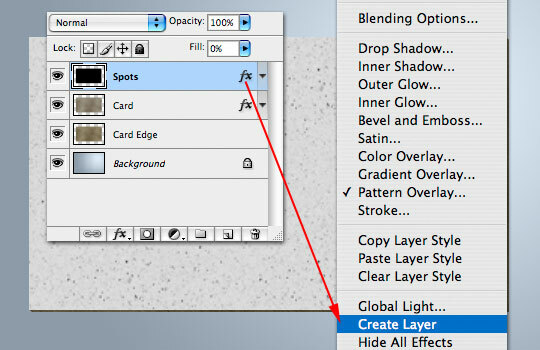 At the top of the Layers palette add a new layer called "White Paper". Drag out a selection where the white paper is going to live. Be sure to run the selection a little wider than you want to end up with so we can trim off the left side to wrap around the card later. (My selection is 400×90). 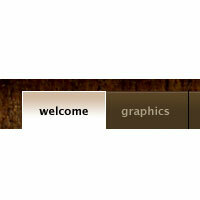 With the selection made, switch over to the Channels palette and add a new Alpha Channel for the selection by pressing the New Alpha Channel icon at the bottom of the Channels palette. With the new channel created, press Command-D (PC: Ctrl-D) to deselect. 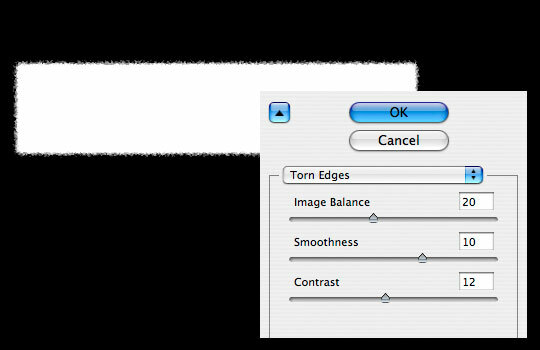 Now lets add a little bit of torn edge effect by choosing Filter>Sketch>Torn Edges from the main menu, apply the settings below and click OK.
Command-Click (PC: Ctrl-Click) on the layer thumbnail in the Channels palette to load the channel as a selection. 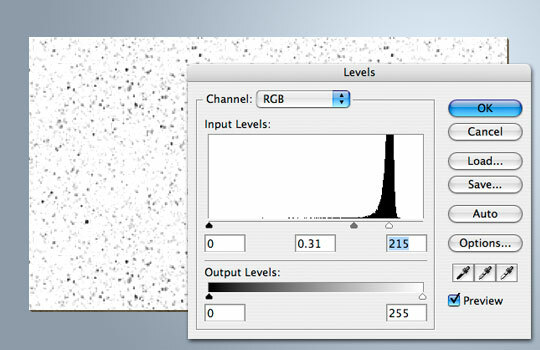 Click on the RGB channel to expose all the channels once again then switch back to the Layers palette. Now simply fill the selection with white and deselect. 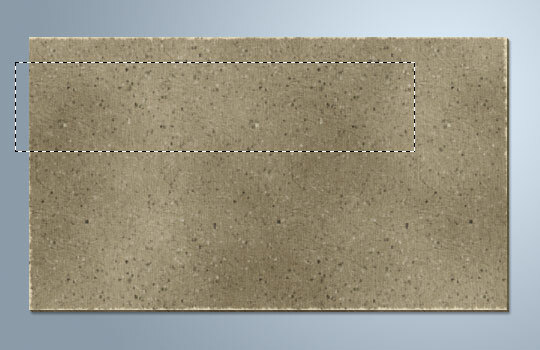 For my tastes this white paper piece is a little too fuzzy around the edges, so I’m going to go ahead and use my Rectangular Marquee tool to cut down the edges a little, I’m also going to add a little drop shadow to the layer and I’ll cut down the left side of the white paper to just a few pixels past the edge of the card. Next lets select the left side of the white paper, just the section at the edge so we can bend it around the card a little bit. With the selection made, press Command-T (PC: Ctrl-T) to invoke the Free Transform tool, then using the Warp command, bend the edges until they look right to you. 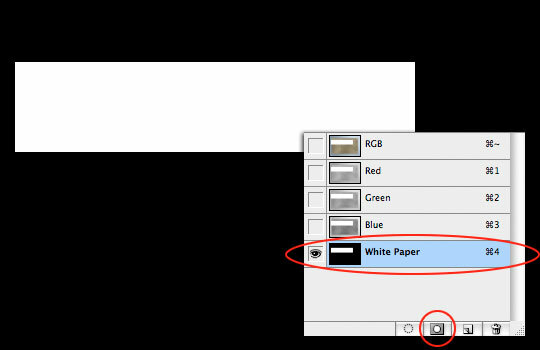 To make the edge wrap a little more convincing, add a slight gradient to the edge of the white paper. All that’s left to do now is decorate. 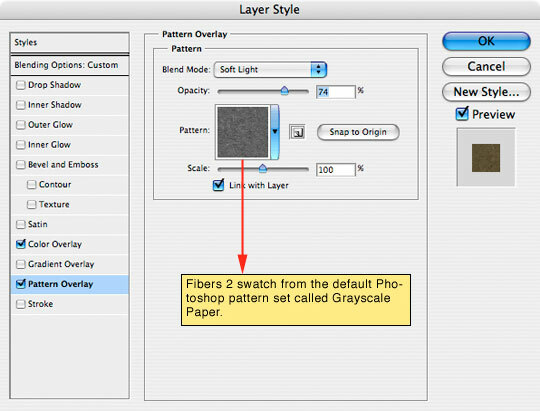 You can find all the additional layers and layer styles in the downloadable lesson files at the end of the tutorial. I’ve used more layers and layer styles to create the graphic decorations on the card, I’ve also used slight amounts of noise in the large color blocks to give a more realistic paper and ink look. I hope you’ve enjoyed the tutorial. This one’s a little over my head, but a really cool tutorial all the same. The cardboard effect is quite realistic. Hey I love your design i managed to replicate it with the instructions but i am wondering how you turn your image as you did in the first picture I saw of the card I think it is three cards on top of each other. If I could be helped that would be great. I created a plane using the Vanishing Point filter and then pasted the business card onto the plane giving the effect that they’re laying on a table. I’ll put a Vanishing Point tutorial on my list of things to do. 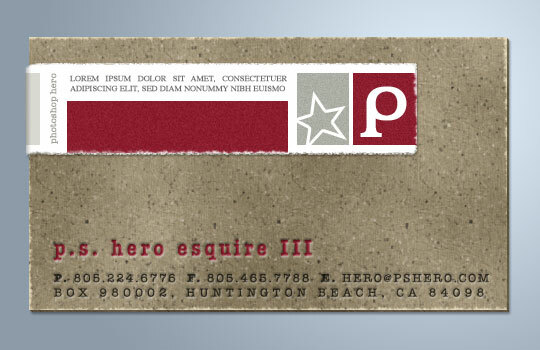 With respect to great tutorial here, does anyone know a printing company that will print your design on actual cardboard paper for business card possible with embossed text print? Wow, cool effect :) I’ve been looking for inspiration for my new business cards and I think I’ll have to give this one a go. Thanks! 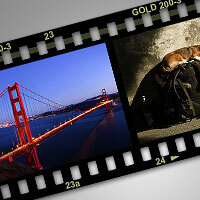 Not only is this an amazing tutorial I think it increased my abilities in Photoshop 200%. What fonts did you use for the printing at the end? Glad to hear that you learned something! 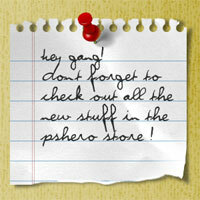 The fonts used are American Typewriter, Times and the big “P” is in a font called Amerika. You can always find out what fonts I used by downloading the .PSD file at the end of the lesson and clicking on the text layers in the Layers palette. The font used will be shown in the Characters palette. I’ve been to many tutsites on the web throughout last 6 months. And Yours are just tip-top. Lots of sneaky-tricky teknicks ;). Thanks. I merge the two layers on the bottom and removed the Bevel and Emboss in the top layer and the edge effect details cannot be seen. GERRY, Did you remember to shift the layers top 2 layers 2/1 pixels in each direction? This tut is a bit over my head, but best way to learn, this effect looks unreal. But I’m stuck on step 5. When I add my layer style color overlay, it’s opaque colour, I no longer see the nice texture? LORRAINE, I’m guessing you didn’t change the blend mode of the Color Overlay style to Color. If you leave the blend mode as Normal it’ll be opaque as you experienced. I haven’t tried it yet, just seen it and I must say it looks to be the most challenging tutorial I have ever seen; and the effects I see here are ones I’ve often wondered on how the designer achieved. thank you for you artistic works, I’m loving them!!! kool it was so easy to follow n i loved the end result thankyou!! THANKS! Very nice effect. No stock art involved! This was really cool! Thanks so much for sharing.